As the name implies, datum transformations transform your data from one datum to another. The latitude and longitude location in NAD27 datum differs from NAD83 or WGS84. This difference is known as a datum shift. Depending on where you are in North America, NAD27 and NAD83 may differ in tens of meters for horizontal accuracy. The average correction between NAD27 and NAD83 is an average of 0.349″ northward and 1.822″ eastward. In this case, you would need to perform a datum transformation. The first thing you should be careful of is that the physical locations have not changed. Most survey monuments have not moved. Datum shifts happen because survey measurements improve, there are more of them and methods of geodesy change. This results in more accurate geodetic datums over time. 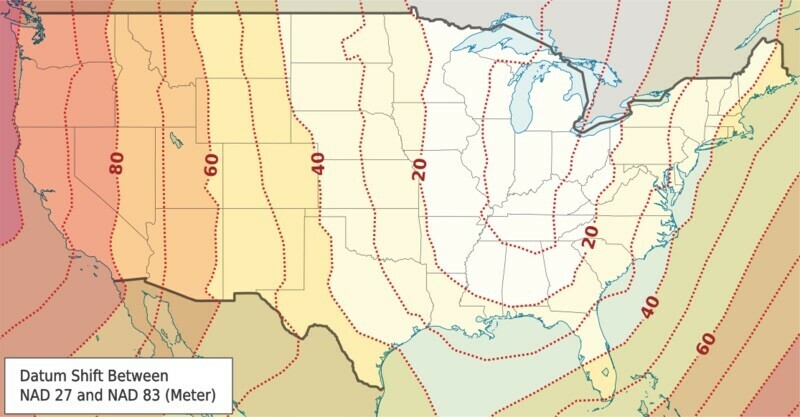 The horizontal datums that form the basis of coordinates of all horizontal positions in North America improve. Because maps were created in different geodetic datums throughout history, datum transformations are often necessary when using historical data. For example, USGS topographic maps generally were published using a NAD27 datum. A datum transformation would be required when worrying with other NAD83 data. When do you need datum transformations? All coordinates are referenced to a datum. 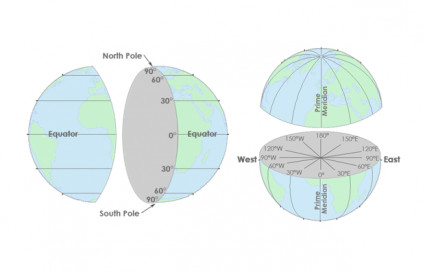 A datum describes the shape of the Earth in mathematical terms. A datum defines the radius, inverse flattening, semi-major axis and semi-minor axis for an ellipsoid. The North American datum of 1983, NAD83, is United States horizontal or geometric datum. It provides latitude and longitude and some height information. Unfortunately NAD83 is not the only datum you’ll encounter. Before the current datum was defined, many maps were created using different starting points. And even today, people continue to change geodetic datums in an effort to make them more accurate. A common problem is when different coordinate locations are stored in different reference systems. When combining data from different users or eras, it is important to transform all information to common geodetic datums. Projected coordinate systems are based on geographic coordinates, which are in turn referenced to a datum. For example, State Plane coordinate systems can be referenced to either NAD83 and NAD27 geodetic datums. What is a datum transformation? For any type of work where it’s important for coordinates to be consistent with each other, it is critical that the same geodetic datum is used. If you are marking property or land boundaries or building roads or planning for coastal inundation scenarios, you must know about and use the correct geodetic datums. When you transform NAD83 and NAD27 geographic coordinates to projected State Plane coordinates, it is the same projection method. 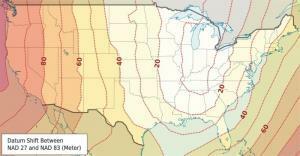 However, because the geodetic datums were different, the resulting projected coordinates will also be different. Geodesy is the field of applied mathematics that studies Earth’s shape, orientation, positions and gravity for the past, present and future. But where can I find the origin alignment, axis rotation, and scale information that will allow me to relate Clarke 1866, GRS80, and WGS84?